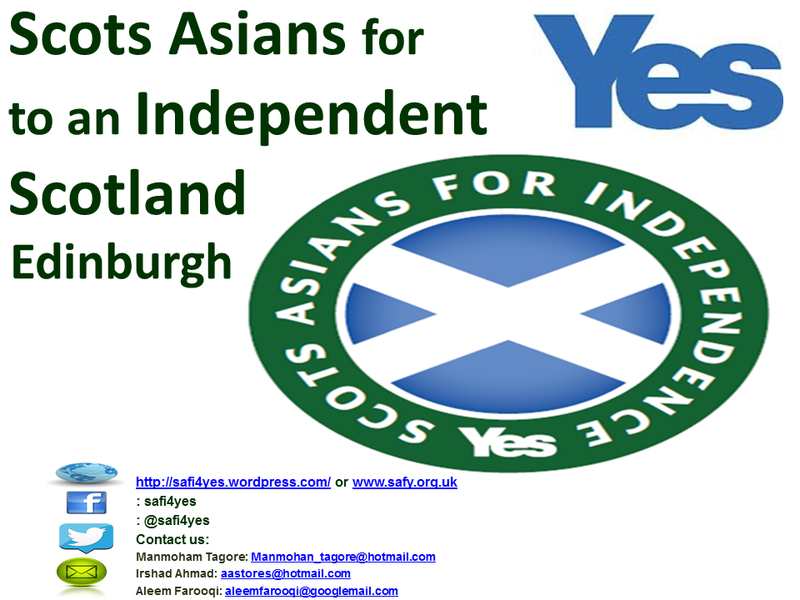 Scots Asians for Yes DUNDEE! 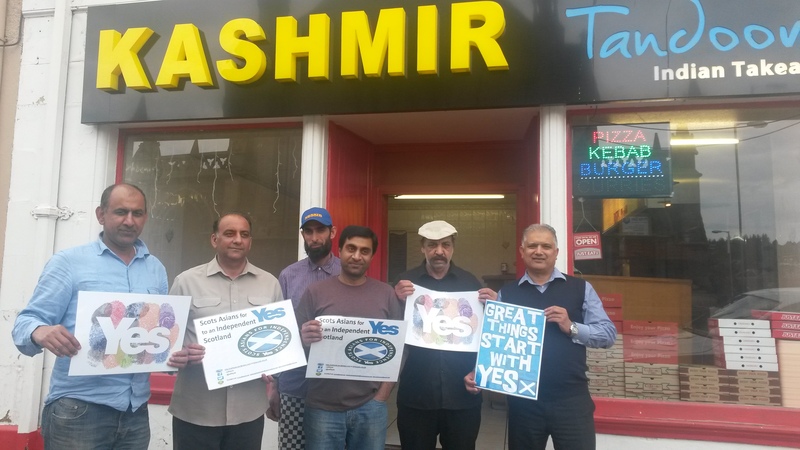 Welcome to Scots Asians for Yes Dundee. Wonderful to see young and vibrant members of our communities getting more involved and taking ownership. 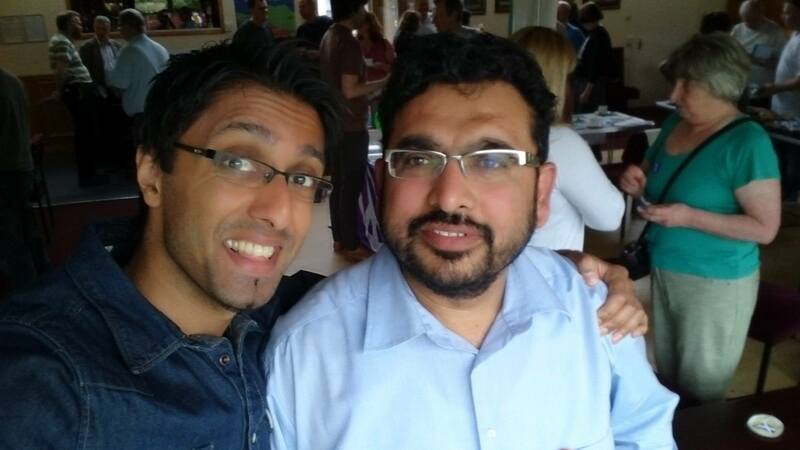 A huge thanks to Fahd Ali Asif, who until a few days ago was an undecided. 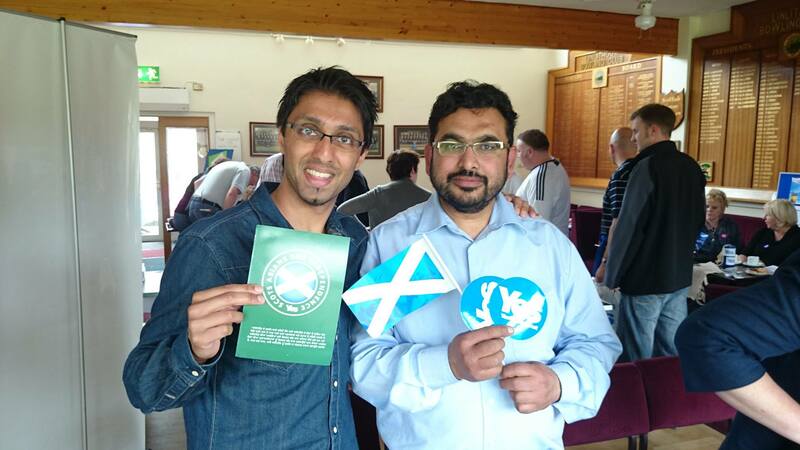 Fahd attended a public meeting this week in Dundee where Humza Yousaf MSP, Shona Robison MSP and Aamer Anwar were speaking and decided to get involved in helping us get the message out across our communities and working with other pro-independence groups. Again, a positive result of sharing a message and a vision of a progressive democratic society where all our voices count for every single one of us! Welcome on board Fahd. Look forward to working with you. 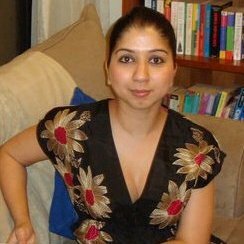 Mumbai and moved to Glasgow with my Scottish husband in 2004. After a few years in Scotland, my husband and I moved abroad again for employment and returned to Glasgow in 2013. We now plan to permanently remain in Glasgow and I would dearly love to live in an independent Scotland. I have had the opportunity of working in various British Embassies overseas marketing the UK as a place to invest and do business in. It was whilst doing this type of work that the idea of Scottish independence was something I started to consider and with my limited experience of life in the UK, wondered why it was something that had not yet been achieved. I can’t really say I am interested in politics generally but for me, the basic question of whether I would like to see Scotland become independent rises above any political issue or debate. Coming from a country that was under the British rule for years, being independent to govern oneself and to make your own decisions is something I strongly believe in and I don’t understand how anyone would want to defer key decisions that affect them to a parliament in another country. Surely the people best placed to make decisions on Scotland should be those that actually live here? I love living in Scotland and love the Scottish culture, the Scottish drive and the ambition. As an “outsider” or at least someone looking at the country with fresh eyes, the potential for Scotland once independent is limitless. I firmly believe there will be more job opportunities, more investment, and more possibilities for the people of Scotland. I have also decided that on this road to independence, I want to be part of the process that will be remembered as the best thing that has happened to Scotland. Therefore no matter how small my contribution, I will continue to say YES, and tell everyone I know and meet why I am going to say YES come September. Join us at a Community Event this Sunday! Come join local activists at a community event at Pollokshields Primary School, Albert Drive, Pollokshields, Glasgow. Looking forward to seeing you there! 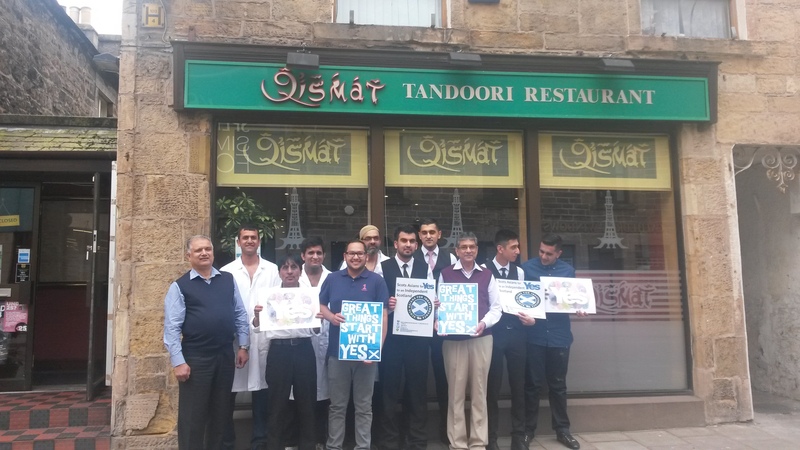 As Moni Tagore ran a successful SAFY stall at the Yes Linlithgow event yesterday with Mr Yousaf Senior, there were Yes Events, Public speaking, Stalls all across Scotland. I decided to drum up some support amongst my own friends, colleagues and business associates up in the Highlands and Islands and Morayshire. It was a great success. The support for independence was very high – it was agreed unanimously that it was time to have a voice in matters that concerned us directly, rather than being diluted through Westminster. It didn’t matter where my husband and I went yesterday, it was a resounding yes, and even those that started as a no, were tentative Yes’s at the end of the visit, with promises to do their homework and just pick up the phone if they wanted more answers. Business after business are saying Yes, because they too want a better society for all of us who live in Scotland. 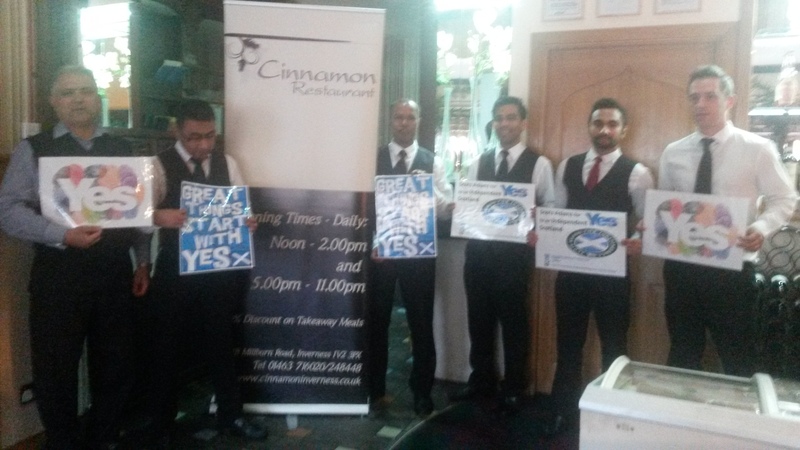 Manmohan Togore will be representing SAFY at the YES Scottish Borders event on Monday 19 May. On the 21st he will be representing SAFY at another event for the Edinburgh Sikh community at Thomas Morton Hall on Ferry Road, Edinburgh. On June 18th, 7pm, we are organising a debate at Edinburgh Central Mosque. 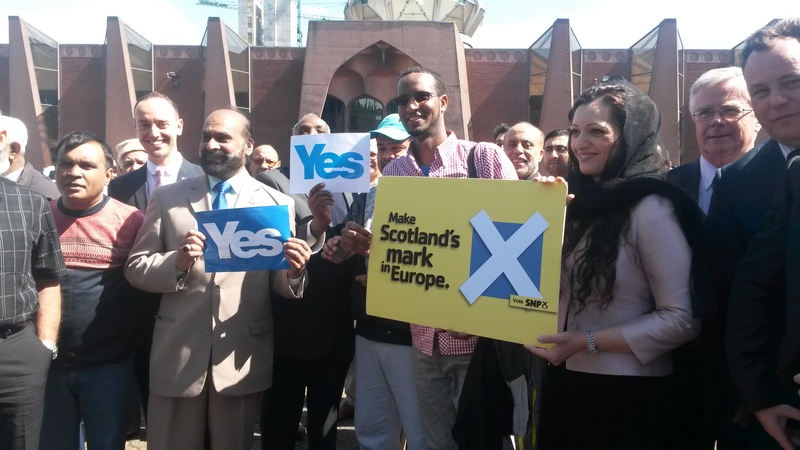 Aamer Anwar will be representing the YES side and Talat Yaqoob will be representing the NO side. Keep an eye out for details on SAFY facebook and website nearer the time. If anyone is in or around Edinburgh and wants to get involved then please contact us. A beautiful sunny summer’s day – I was told that it was the warmest day we had all summer – the first of very more to come – fingers crossed! 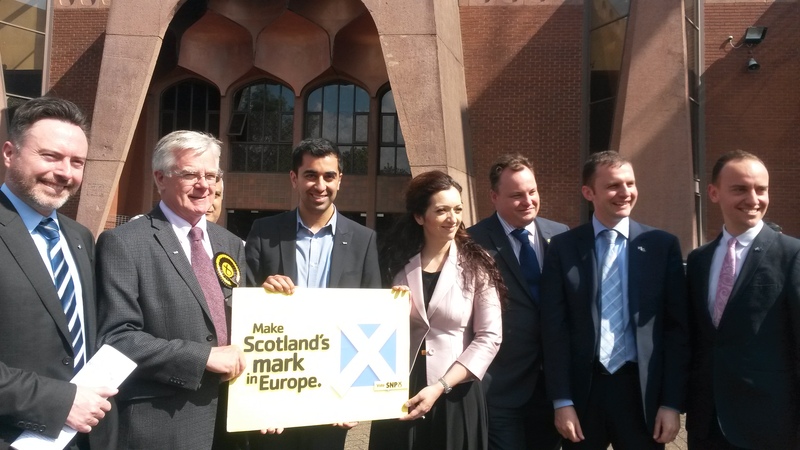 A very busy day for the SNP European Parliamentary Candidates, the Minister for External Affairs and International Development Humza Yousaf MSP and the First Minister Alex Salmond as they visited the Glasgow Central Mosque in Glasgow today. 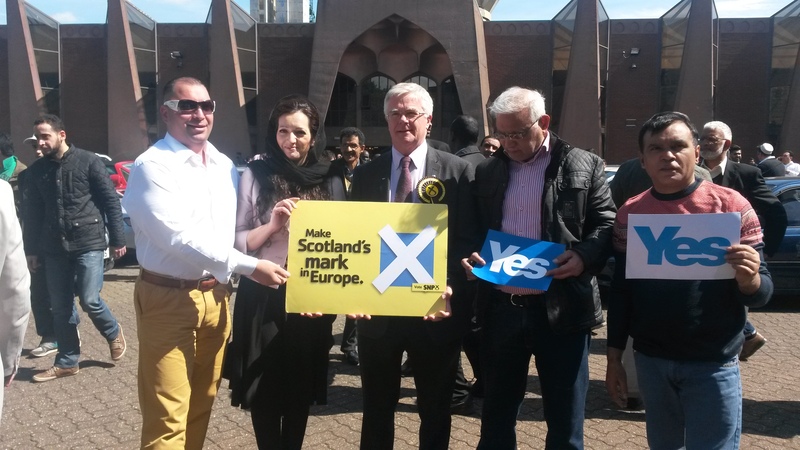 Below are some pictures of the SNP EP2014 candidates on the campaign trail and the warm welcome they received by the very multicultural and diverse community of Muslims at the mosque today. They listened attentively to the concerns and aspirations and welcomed the positive feedback from the community members. 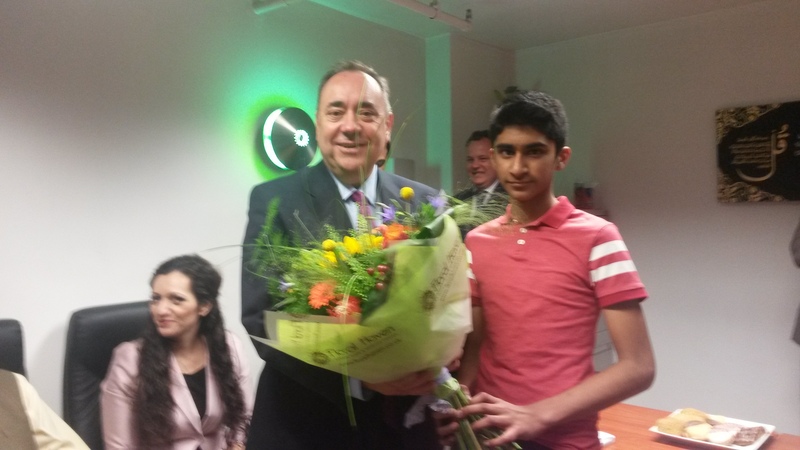 Makki Tahir, the grandson of Mr Majid, SAFI Convenor presented a bouquet to the First Minister and the EP2014 Candidates as he continued his visit to the United Cash and Carry in Polmadie, Glasgow and met with the owner Mr Mohammed Ramzan.